Protect communities and our planet by reducing the amount of water you use. 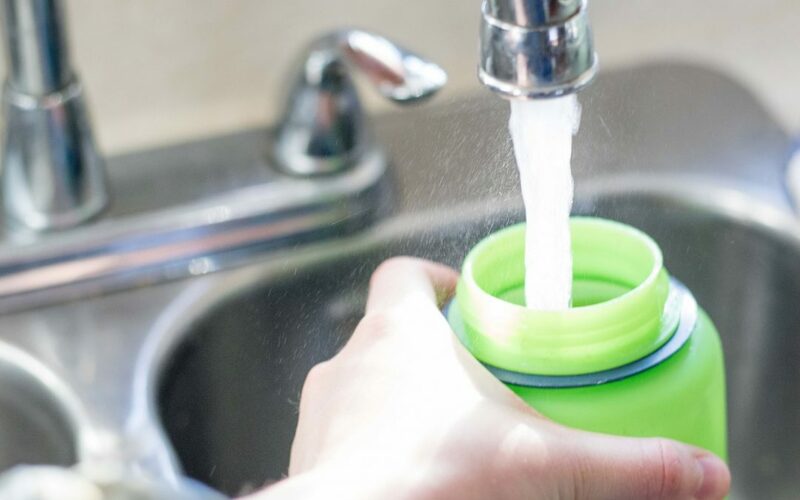 To help you get started, we’ve compiled a list of 14 things to do in your life to reduce water waste. Did you know that it takes 2700 litres of water to make the average t-shirt? Jeans are even worse. One pair takes 7600 litres. That means an average outfit uses 10,300 litres of water to make. Think about it…10,300 Nalgene water bottles full of water. Avoid purchasing new clothes whenever possible to help save water. Save water and money by installing low-flow toilets, shower heads and faucets. For a household of four people, this means over 100,000 litres of water saved per year. Don’t think that keeping the tap on while doing these things takes up that much water? Plug the drain sometime and see just how much is collected in the sink. Multiply that over 365 days, likely a few times a day. That’s a lot of water. Ensure as much rain water as possible soaks into your lawn by periodically aerating it. Not only will you save water, you will also put less effort into watering your lawn. Depending on your toilet, each flush uses 6-26 litres of water. Resist flushing your toilet whenever possible. Have leftover ice in a bowl or cup? Instead of dumping it in the sink, let it melt and use the water to hydrate your plants (or drink it yourself). Save rain water and use it to water your garden, indoor plants and lawn. One drip per second equates to 19 litres of water per day. Check inside and outside your home to ensure no water is leaking. More dishes means more washing. Not only does that mean extra time and effort, it also means extra wasted water. Your dinner tastes just as good served in the pot it was made in as it does in your fancy serving bowl. Cooking pasta (or vegetables)? Let the water cool and use it to water your plants. Extra water is evaporated when you water your plants and yard in high-heat. The most efficient time to do outdoor watering is during low-heat. Already taking short showers? Maybe it’s time to cut back on the number of times you shower per week. A quick wipe with a soapy washcloth goes a long way in preventing smells. Don’t waste water by running loads that aren’t full. This will save water and time by cutting down on the number of loads you do. Ultimately, a newer more efficient toilet is best. But that’s not a realistic option for everyone. If your toilet is an old, water-sucking one (from around 1990 or earlier), place a weighted bottle in the tank to decrease the amount of water used with each flush. More here. Drinking tap water, instead of bottled water, saves 3L for every 1L you drink! Bottles of water take 3 litres to make just one 1 litre bottle – plus buy purchasing it, you contribute to the commodification of a human right. (Of course, if the place where you live does not have safe-to-drink tap water, bottled may be your only option! But basically everywhere in Southern Manitoba has high-quality tap water available on demand for nearly free).